Following on from the fabulous turnout of Independence Supporters at the Hands off Our Parliament and All Under One Banner events, the Edinburgh Yes Hub is looking to continue the positive momentum with a Rally in Inch Park on 16th June. We already have a great line up of speakers and musicians, as well as the usual selection of stalls. We'll also have some entertainment for the younger indy folk with a bouncy castle and facepainter. ​1pm and 5pm on 16th June 2018. Paul Kavanagh "Wee Ginger Dug"
Inch Park is just south of Cameron Toll Shopping Centre in South East Edinburgh. 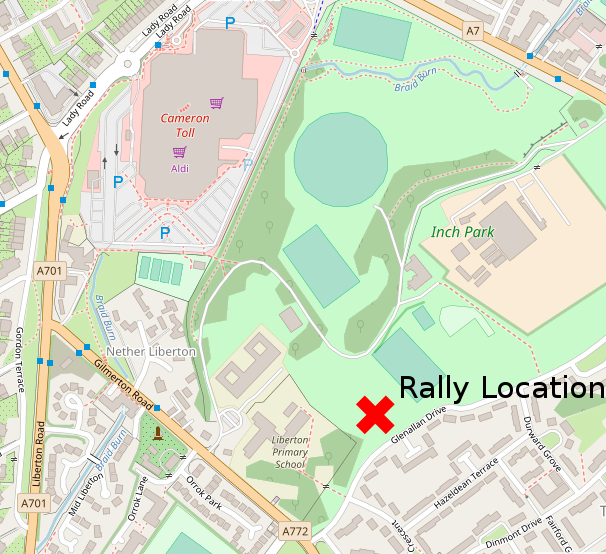 The Rally will take place in the Southern End of the Park near Glenallan Drive. Get off the at the Gilmerton Junction. Arrive at the North East side of the park. For where to park see Parking Information below. Alternatively, you can park at Straiton Park and Ride and take the bus. See Park and Ride below. The nearest main station is Waverley Station. You can either get a Taxi from there or a Bus from North Bridge (See By Bus below). Edinburgh is well served by buses. See lothianbuses.co.uk for more information. Adult Single £1.70; Child: 80p. No change given. ​Other companies may also have appropriate services. There is no parking inside Inch Park. Please do not use the road that goes through Inch Park or park on Glenallan Drive as these are required for access purposes. Also please not do park on the grassy areas near or in the park. Could you also please do not park your car in the coach drop off point (See Coach Drop Off Point below). So where can I park? Well, there is a lot of on street spaces in the surrounding housing estates in the Inch and Liberton. Please park responsibly to minimise the impact to local residents. Although very close to the rally we do not recommend parking in Cameron Toll Shopping Centre car park as there is a two hour limit. Coaches should drop off on Gilmerton Road by Liberton Primary School. There is a Park and Ride at Straiton. If arriving via the Bypass get off at the Straiton Junction and take the A701 (Straiton Road) south for 0.5 Km. The Park and Ride will be on your right. ​Take the 47 Bus Service from the Park and Ride or the 37 from Straiton Road and get off at the top of Gilmerton Road or at the next stop at Cameron Toll.